I would like to thank everyone who braved the cold weather last night to attend the meeting . Attendance for the meeting was over whelming and was beyond our wildest expectations. With in excess of 200 people it was standing room only. 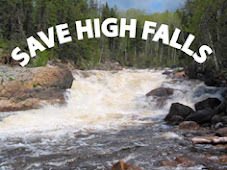 I'd also like to thank all the people that got up and said a few words in support of the Save High Falls Cause. Posted by Markus at 8:35 p.m.